Bookride: J.K. Rowling. Harry Potter and the Chamber of Secrets. 1998. J.K. Rowling. Harry Potter and the Chamber of Secrets. 1998. I thought I would republish this entry to commemorate the £1.95 million ($3.98 million) paid yesterday for a shortish Potter manuscript -"The Tales of Beedle the Bard". 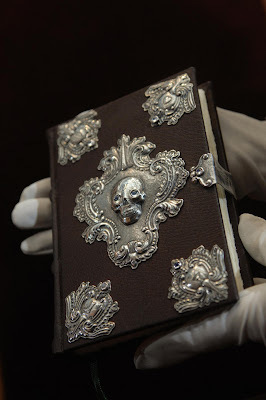 One of seven copies of the Tales, bound in brown leather and decorated in silver and moonstones. Six have been given to people closely connected to the Harry Potter books. Nice presents. Obviously an absurd price but the money goes to a great charity (The Children's Voice) so one cannot knock it and the buyer will have bought many quarters of an hour of fame. (Stop Press--now known to have bought my Bezos of Amazon for publicity, kudos and out of sheer decency etc., The purchase is a pittance compared to his investment in space flight. ) A 'Mad Hatter' price - higher than that achieved for an Alice manuscript even if you adjust the price for inflation. Will do the math on this later - the Alice sold for about £35,000 in the 1930s as I recall. The money will help a very good cause so who really cares? 'Chamber of Secrets' is the second in the immortal Hogwarts series. Print line must read 10 9 8 7 6 5 4 3 2 1. If that is there you have a first edition. In the copy inscribed to her father and stepmother sold in NY 2003 for $9000 JK has circled the figure 1 and written 'First Edition- I got one!' We were once offered a copy by the dedicatee of the book and the owner of the Ford Anglia pictured on the cover. Deal fell through because the guy wanted to buy a house with the notional money, however we asked the all important question. Where is the Ford Anglia? Apparently it was scrapped years ago - a pity because I could see that making housebuying money. It is curious how those who promise some kind of long term return on your investment are always charging twice the price of any other dealer. I guess you just have to hold on to the book that bit longer. 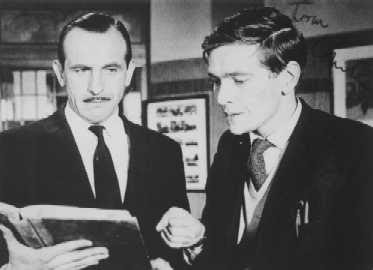 The book is often 'A VERY FINE copy in VERY FINE dustwrapper...unusually lovely...' How fine can a book get, if you have 'very fine' and 'extra fine' can we assume that 'fine' is actually not very fine? It means its a sixth edition and possibly worth 50p, maybe £1, sorry. How you tell is that the last number is the edition. so 1098765432 is a second edition. Gerrit? There's a lot more of this stuuf over at Bookride's post on Philosopher's Stone. Keep searching! 170181252239 (just put the number into the searchbar). Are these books a worthwhile investment as i am really tempted to purchase them. Looks like an overpriced hodge podge that might fool someone, the paperback is not a first (its a second) and rough--the Chamber regular ed is lacking jacket and I doubt they are easy to find and the best book is the limited ed Azkaban which can just make a £1000 once in a lucky while--evitez comme la peste, mon ami! I'm trying to sell an American print Harry Potter and the Sorcerer's Stone signed, hardcover and I'm wondering the value. It's in good condition, no pages are bent but I have read it (I was 12 when I got it). Any advice? Thanks very much that was helpful. I have just one more question: if I want to sell my book somewhere other than eBay, like to a collector or bookstore or something, where would you recommend? In the US is preferred if you know anywhere. I just think if would be easier and more profitable to me to sell it to a known buyer rather than auction it, what do you think? remember -they are dealers and need to make a profit! 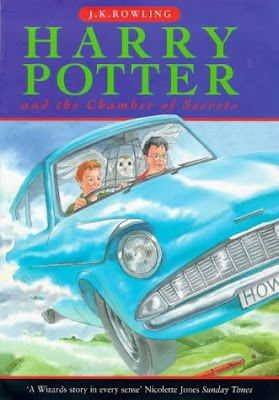 I just bought a Harry Potter and the Chamber of Secrets Hardcover book, that says first american edition, June 1999 isbn 0-439-064864 numberline 20 19 18 17 16 15 14 9/9 0/0 1 2 3 4 Its in perfect condition, no soiling, no bent pages, it doesnt even look like its been read. Would it be worth anything? I have a paper back editon of the UK published Chamber of secrets. It has 10 9 8 7 6 5 4 3 2 1 on it. if the above is a 1998 Bloomsbury some people ask £40!!!! Question. I have new hardback copy of the Chamber of Secrets and there is white stitching that goes around the outside of the cover..it actually covers up some of the title. Is this normal? I have an English first edition of the chamber of secrets book in a dust cover, the ISBN number is 1-85613-612-4 and it had the numbers 10-1. It is printed by bloomsbury. Is it worth anything and where do i sell it? i have a Harry POTTER, chamber of secrets with the nos. one to ten on the inside cover and the ISBN no is o 7475 4577 4. It is the type that has the picture directly on the book without the cover. Any ideas anyone on price or lack of? Hi, don't know if you still reply to questions, but here goes. I bought a Harry Potter and the Chamber of Secrets, US hardback from 1999. It is the first American edition with the numbers 10 9 8 7 6 5 4 3 2 1. Illustrations by Mary Grandpre and 'ancestor' typed on page 332. No number two on the dust jacket. Scholastic press. So far so good, but I am confused because the book does not have the price, 17.95, listed anywhere, nor does it have red end papers. And the spine is blue, not green. I've tried to look it up, but no such luck. Can you tell me if this book is a 1st/1st and/or why it isn't quite like the other US firsts? i have the chamber of secret with the numbers "20 19" at the bottom, does this mean anything? i also have first editions of the "prison of azkaban" and the "Philosopher's Stone" ,where is the best place to sell them? My copy has 12 11 10 9 8 7 6 5 4 3 2 1. Does that count as a first edition? Means a 5th edition copy, correct? I have a first edition chamber of secrets with a signature. Unfortunatley it's been read, and read again as I got it in a second hand book fair a long time ago. So, rag order. It wouldn't be worth anything now I'm guessing, would it? 10 9 8 7 6 5 4 3 2 1 means that it is from the FIRST PRINTING of that specific edition. If the number line reads 10 9 8 7 6, then you have a book from the 6th print run. You can find out which edition you have by looking up the ISBN number, looking for "First Edition" or "First American Edition" at the bottom of the copyright page. I have a Harry Potter and the Chamber of Secrets that says First American edition 1999 Printed in U.S.A. 12 ISBN 0-439-06486-4 25 24 23 21 21 9/9 0/0 1 2 3 4. Is there any worth to it? Arthur Cravan. Maintenant 1912 - 1915. Mushrooms, Russia and History, 1957. The Invisible Man. H.G. Wells. 1897. J. G. Ballard. The Atrocity Exhibition, 1970. Mark Twain. Huckleberry Finn, 1885.